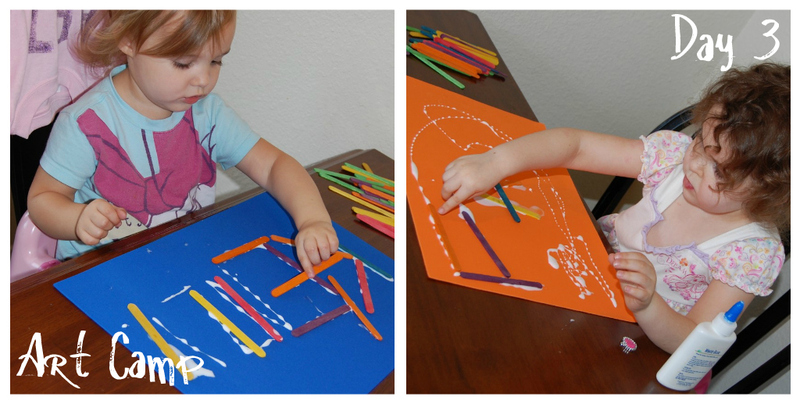 Here is what we did for Art Camp at home on days 2, 3, and 4. On day 2 we made jewelry. The girls strung beads to make necklaces and bracelets to keep in their treasure boxes. On day 3 we made popsicle stick art. For Kenzie I wrote her name with glue and she placed the popsicle sticks on the glue to spell her name. Allie drew her own letters and pictures with the glue and placed the posicle sticks over the glue. We also used the popsicle sticks to make several shapes and letters without gluing them to anything. On day 4 we did shape art. Allie cut out her own shapes. Some of them she did completely on her own, like the door for her house, other's she had me draw a window or triangle and she cut them all out on her own and glued the pieces where she wanted to make a picture from shapes. I love the way Allie's turned out. For Kenzie I cut out several shapes and let her glue them on the paper and had her tell me what each shape was before she glued it on. Of course she had to add stickers to hers as well. More on our final day of Art Camp at Home to come!